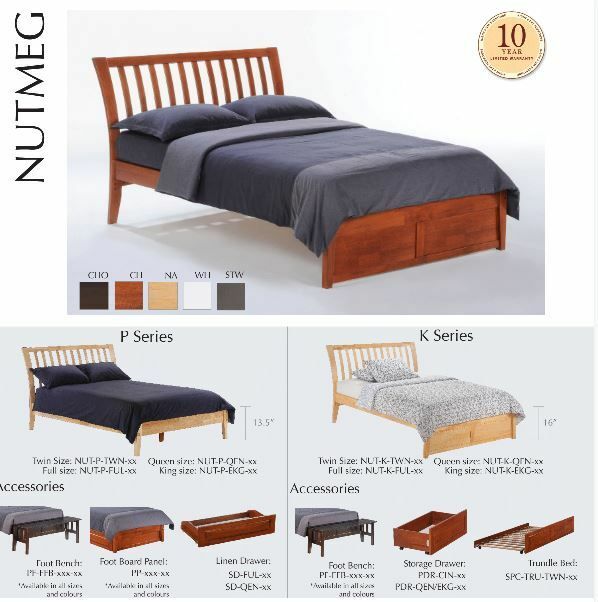 Sleigh style Platform bed. The platform is supported with a complete kit of slats as well as center slat support and four center legs for great support. Universal Bed Rails come with our patented Thumnut™ for easy assembly of legs and rails. Beds come complete with 10 pcs of 1x4" mattress support slats, and supported down the center with our rail and foot support system. The Bedroom Collection beds comes with a variety of useful and attractive accessories including our patent pending Folding Footboard Bench. Our models are beautifully finished with automated and hand-rubbed techniques for a rich and durable finish. We use solid plantation grown hardwood throughout the Spices Collection as our primary construction material. Clear, completely illustrated assembly instructions. Beds come in Twin, Full, Queen, Eastern King All Beds. Made of Indonesian sold wood. 10 Years manufacture guaranty. Metal to metal connection between the side rails and the front/back panels. Optional storage drawers and privacy panel available. Available finishes are Natural, White, Cherry and chocolate.